The Shockers are off to the best start since UNLV began 34-0 and lost in the 1991 national title game. WICHITA, Kan. — The chant started when Ron Baker walked toward the Wichita State bench for the final time, and reached a crescendo when he popped the front of his jersey – No. 31. As in, 31-0. A perfect regular season. Baker finished with 13 points, Cleanthony Early led the way with 19 and the second-ranked Shockers rolled to a 68-45 victory over Missouri State on Saturday, becoming the first team since Saint Joseph’s in 2004 to enter its conference tournament unbeaten. Wichita State (18-0) will have a first-round bye in the Missouri Valley tournament next week. Missouri State (19-11, 9-9) had the Shockers in trouble when they met Jan. 11 in Springfield, Mo., but the Bears blew a 19-point second-half lead and ultimately lost 72-69 in overtime. They never came close to making it a game Saturday, trailing by double-digits in the opening minutes and rarely trimming the lead to fewer than 20 points in the second half. The result is the best start since UNLV began 34-0 and lost in the 1991 national title game. Wichita State is also off to the best start by a Missouri Valley team since Indiana State, led by Larry Bird, won its first 33 games and fell to Michigan State in the 1979 title game. The Shockers’ last loss came in the Final Four, too – to eventual champ Louisville last year. Putting this one away early gave a raucous crowd that had braved the threat of freezing rain ample opportunity to celebrate. Waving signs that applauded their unblemished record, fans packed inside Koch Arena serenaded a senior class led by Early that managed to elevate the program from a solid mid-major into a national power in the midst of a memorable season. Along with fellow seniors Chadrack Lufile, Kadeem Coleby and Nick Wiggins, Early gave Marshall a bear hug when he checked out for the final time in the closing minutes. ”I’m just very, very proud of these guys,” Marshall said. Jarmar Gulley scored 15 points to lead Missouri State, which was dominated on the boards, in transition and just about everywhere else in losing its 10th straight against ranked teams. Unlike the first meeting, when it was Wichita State that stumbled early, Missouri State missed 18 of its first 22 shots, suffocated under token pressure and never got into a rhythm. When the Bears weren’t blowing layups, they were turning the ball over, leading to some easy baskets at the other end. Wichita State shot 57 percent from the field in the first half, a big reason why it had built a 20-point lead just before the break. The trio of Early, Baker and Fred VanVleet picked up where it left off out of the locker room, Early scoring quickly and Baker hitting a long 3-pointer to keep Missouri State at bay. In fact, the only interesting moment of the second half came when Lufile was fouled with about 10 minutes to go. After missing his first seven free throw attempts, the big senior forward – with the crowd rising to its feet – finally got one to rattle home. Of course, it hardly mattered that Lufile’s foul shooting wasn’t perfect. 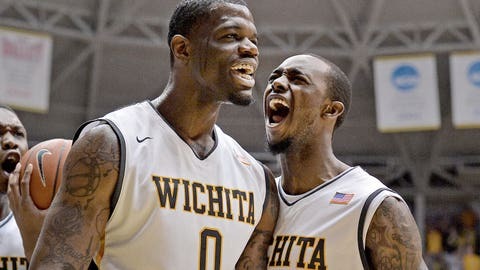 Everything else about Wichita State is these days.